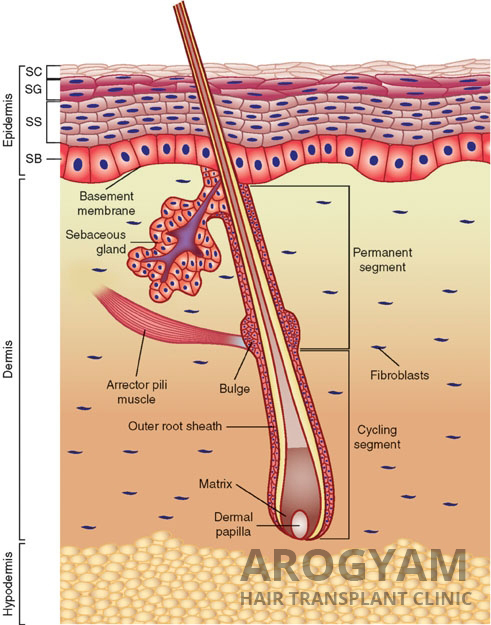 Direct Hair Implantation is a much advertised technique nowadays and publicity material from the companies which use this technique suggest that it is a completely novel method with a higher success rate. But actually direct hair implantation is not a different technique from FUE but only a modified form of FUE. In this technique as explained by the companies, all other steps are the same as the normal straightforward FUE and it only differs in one small step of the FUE process. 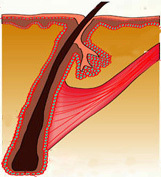 In the normal FUE technique which has been invented and refined by world renowned experts throughout the globe, the graft after being cut by the drill punch, is extracted by the assistant and placed in an isotonic solution, and then planted by the assistant. In direct hair implantation, the only difference in this step is that the graft is not removed from the scalp and allowed to remain in it, and the assistant plants it from the scalp itself. Although companies doing direct hair implantation claim that this method improves results, there is no evidence for this at all. It is nothing more than an advertising gimiick. Once the graft is cut by the drill, it loses its blood supply and so there is no difference whether it is kept in a scalp or kept in a tray. The cells still survive for a long period when kept in an isotonic solution, and so the only requirement is that it should be kept in an isotonic solution. There is no scientific evidence whatsoever that keeping the grafts in the scalp improves results in any way. Direct hair implantation is done only by 1 or 2 companies in the world. Except for these 1 or 2 companies, the vast number of world leading experts and masters of this technique throughout the world do the straightforward FUE as it is more convenient and efficient. The companies which do this use it as a clever marketing strategy to sell it as something novel and different so that they can then make wild claims for this and fool patients. If there was really any evidence that the direct hair implantation method worked better, all FUE surgeons throughout the world would have used this method instead of the straightforward FUE as there is very little difference in the technique and nothing much to be learnt. But world leading experts throught the globe do not want to waste their time on a technique for which there is no supporting evidence at all. All the information found about Direct Hair Implantation on the web comes from the companies which are doing this technique, and so naturally they write a lot of praise about it and sing its uniqueness. Independent information and reviews of this technique are not available as the vast majority of experts and world leaders in the field of hair implantation are not interested in what seems only like a gimmick, and so there are no scientific studies or balanced information about this technique from independent reviewers. Companies doing this process also use other marketing tools and make various claims about planting with implanters, extracting upto 6000 hairs in a day, more natural hairline, etc. When examined closely, these claims are seen to be nothing more than hype. Such companies claim that FUE cannot extract more than 2000 hairs in a day while direct hair implantation can extract 6000 hairs in a day. Here attention should be paid to the fact that the term 'hair' is used and not grafts. It is true that in general an accredited FUE surgeon does not extract more than 2000 grafts in a day, but here we are talking about grafts not hairs. 2000 grafts means 5000 to 6000 hairs anyway! So this is another instance of cleverly fooling the patient by confusing him with terms. At Arogyam Hair Transplant Clinic we regularly extract 2000 grafts in a day which means 5000-6000 hairs in a day. Read herehere to know more about the difference between hairs and grafts. Claims like a more natural hairline, etc are also nothing more than self praise as the methods of drawing hairlines, etc are the same for all FUE and is related to the experience and knowledge of the doctor, and the technique used for hair extraction plays no part in this. An experienced doctor who has done hundreds of cases himself is always going to be better than the temporary doctors employed by a clinic chain. Also FUE does not require complete shaving also but only trimming, which is another claim by such clinics. Planting with implanters is nothing unique as more and more hair transplant specialists throughout the globe are using implanters for planting. Implanters were first introduced in Korea by Choi and have been steadily gaining in popularity since then. This is not because of superior results but because it is faster, and the learning curve for the assistant is much less. Arogyam Hair Transplant has been using implanters for planting since the beginning of the clinic and we use Choi type implanters in all our cases. Use of marketing terms like 'total patient care system' which actually mean nothing should be suspect. Instead of giving straightforward information, such terms are used to confuse and attract patients. Potential customers should be careful not to fall for bombastic comments and instead try to find out what actually is being done. Any technique which is based on self advertisement and not on scientific evidence should not be trusted.